A4 Standing Floor Signs - Dual-Sided w/A4 Pocket - Ships Same Day! Looking for standing floor signs to better advertise at your business? 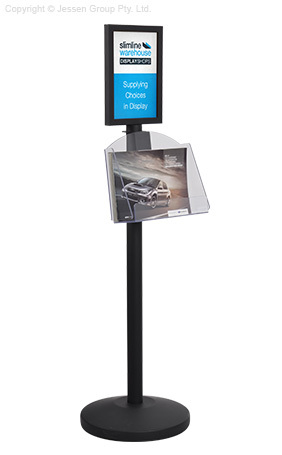 These floor sign holders are versatile displays combining two class promotional tools to create an all-in-one display for many types of locations. The dual-sided display helps to maximise your floor space, able to be seen in multiple directions at once from a single footprint. The slide-in poster frame is designed to hold A4 (210 x 297mm) posters in portrait orientation on each side, with PET lenses helping to secure the graphics in place and prevent grime or dust build-up whilst on display. The advertising poster signage, standing floor signs use an acrylic pocket to hold brochures below the posters, providing take away information to potential customers. The clear acrylic holder is designed to hold A4 literature in landscape format, and can also display (2) DL (99 x 210mm) pamphlets, making it great for holding menus at restaurants for customers to browse through whilst in the queue. The pocket is adjustable up and down the centre column for positioning that best suits you needs. This steel advertising display works well in a number of locations, including car dealerships, museums, shopping centres and grocery stores. The durable build combined with a black matte powder coat finish ensures a resilient display that holds up well to daily use in heavily-trafficked areas, with the neutral finish great in any décor. Set-up is easy, with simple tools all that's needed for assembly in minutes. Order today by 2pm EST for same day Australia-wide despatch when in stock with this and most other items, only from Slimline Warehouse!